Floods in Venice - all info: How do I find out about the flood? What should I do in case of high water? Current information about the MOSE project. Hardly any other city in the world is more frequently hit by flooding than Venice. Even most tourists know the Italian term for flood "Acqua Alta". Remedy is to come: One of the largest construction projects in the history of Italy is to protect Venice from flooding in a few years with gigantic locks. The floods are particularly frequent in autumn and winter. For tourists this is of course a problem, but also an attraction. Large parts of the old town are affected, most frequently the south of the main island of Venice around the major sights at St. Mark's Square. However, floods around the Rialto Bridge are rare. Both "Rialto" and "Acqua Alto" contain the Italian word "alto", which means high. In the case of Rialto in the sense of high altitude, in the case of Acqua Alta in the sense of high water. By the way, the high water has little to do with the sinking of the city of Venice. The sinking of Venice has also been largely halted in recent decades. The main reason was the extraction of large quantities of groundwater in earlier times. However, the number of floods in Venice has increased statistically. According to most scientists, this is mainly due to climate change. But this, like almost everything else, is also controversial. As a tourist, how do I find out about the impending flood? The famous floods of Venice are more frequent in autumn and winter than in spring and summer, but it can occur all year round. The northern Adriatic region, unlike most other Mediterranean regions, has relatively strong tides. Thus, floods usually only occur for a few hours at high tide. However, this also means that the flood comes relatively quickly, which makes things much more dangerous. The height of the flood depends among other things on the moon. Especially around the days of new moon and full moon the danger of flooding is high. Much rarer is the water level in Venice at half moon very high. If you are planning a trip to Venice, you can take this into account. Another important factor is the weather. This includes the strength of the wind, the wind direction, the air pressure and more. There are good websites that make a flood forecast for Venice similar to a weather forecast. Similar to a weather forecast, flood forecasts are more accurate a few days in advance. You see how the water level periodically fluctuates with the tides. Important are the highest points in the curve. From about 100 cm we speak of Acqua Alto (flood) in Venice. 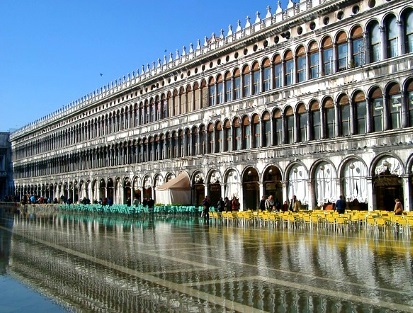 The Piazza San Marco is already up to 20 cm under water, most other parts of the old town are not yet affected. From 110 cm there is a larger high water alarm, also for example on other islands in the area. About 10 % of the old town are already covered with sea water at this water level. What should I do at high tide? That depends on the height of the flood. For example, if, as is often the case, St Mark's Square is only a few centimetres flooded, the municipality of Venice will erect footbridges. You can then walk on these artificial flood overpasses. But the footbridges are not everywhere. On many ways you have to walk through the water. Then rubber boots help with some centimeters of high water. 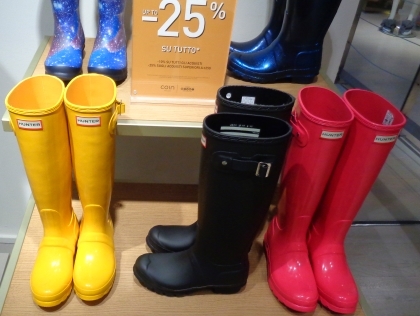 Rubber boots can be found in Venice in many shops, the inhabitants often need them at high tide. There are not only simple rubber boots, because of their frequent use in public, the waterproof shoes in Venice are a fashionable product. If the high water is much higher, it is better to postpone the visit to Venice. Then a visit to the city makes little sense and can also be dangerous. Often the floods last only a few hours during the high tide. A few hours later at low tide the water level is often normal again. Many locals have great experience in dealing with their Acqua Alta (flood). Nevertheless the flood in Venice is a constant topic of conversation like the weather. Even the most famous bookshop in Venice is called "Acqua Alta". It is one of the biggest construction projects in the history of Italy. Movable flood gates are designed to protect the entire Venice lagoon during heavy flooding. The Venice lagoon is only connected to the Mediterranean Sea at three points (see map). This is between the north of the long island Lido and the mainland, between the islands Lido and Pellestrina and between the south of the island Pellestrina and the mainland near the city Chioggia. Huge gates are currently being built in all three passages. These locks will be almost always open and only be closed in the event of very high water. The Mose project is very controversial. It costs many billions and is ecologically questionable from the critics' point of view. Some Venetians also doubt whether the new flood protection will ever really work. The MO.S.E project is almost finished after a long construction period and many delays. The new locks are to be used for the first time in 2019. However, a further delay cannot be ruled out. The MO.S.E is one of the world's largest technical projects against flooding. But there are also gigantic, mobile flood barriers in the Netherlands and England (protection of London).